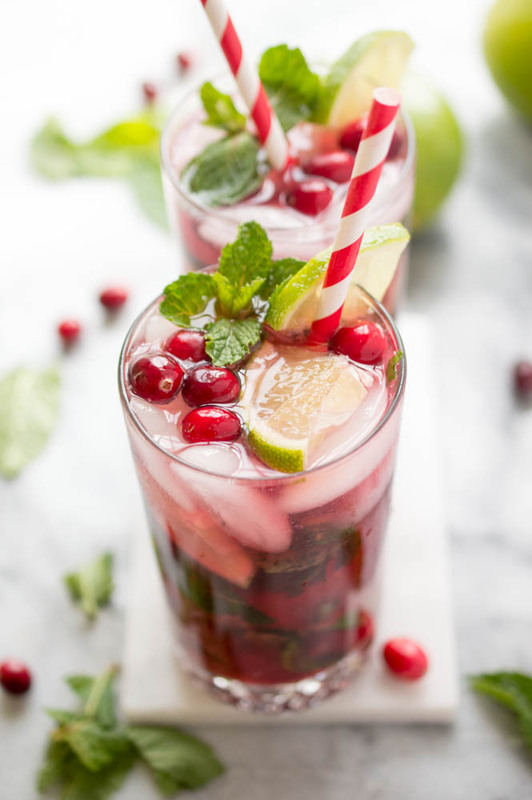 Holiday Cranberry Pomegranate Mojito made with fresh mint, cranberry reduction, pomegranate juice and fresh lime. 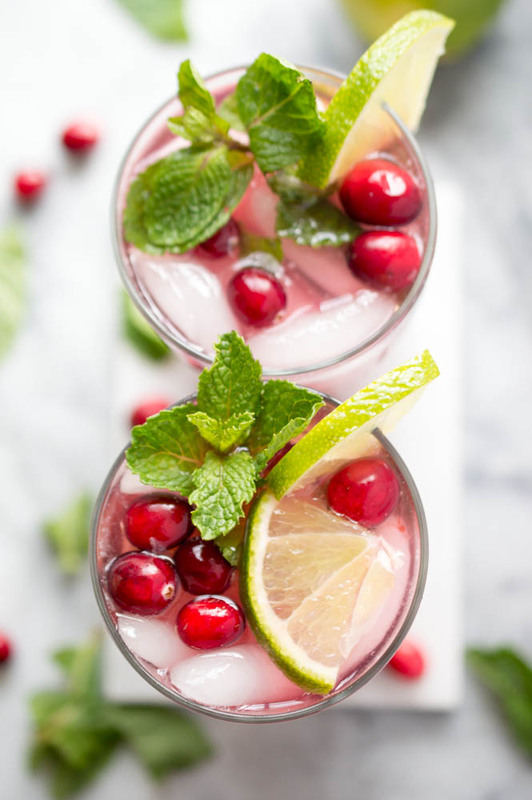 Perfect cocktail for the holidays! Mojitos are one of my favorite drinks. In my opinion they should be served all year round not just in the summer. 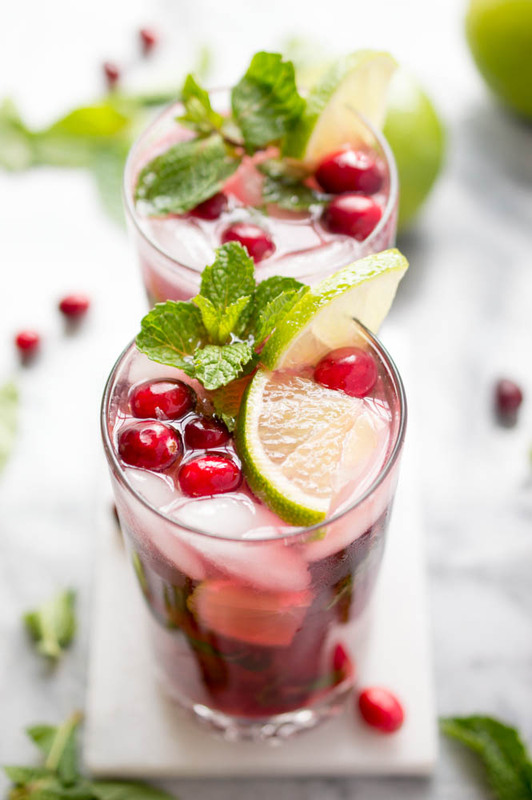 I added a holiday twist to my classic mojito recipe with fresh cranberries and pomegranate juice. Typically mojitos are made with a simple syrup (sugar + water). I added the cranberries with the simple syrup to make an easy cranberry reduction. This mojito is both tart and sweet. Extremely refreshing with a splash of fresh lime juice. This beautiful red and green cocktail is super festive. Splashes of sparkling water are added to each glass for a little fizz. 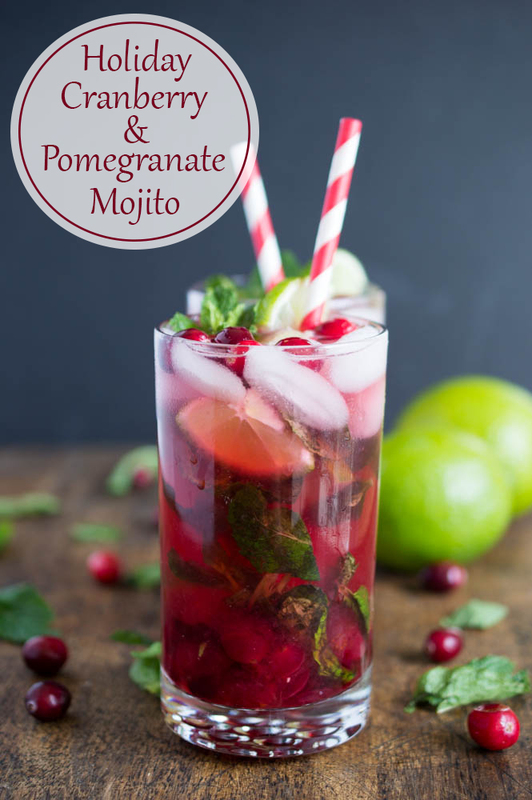 To make these festive Mojitos we need to start with our cranberry reduction. Fresh cranberries are easy to find this time of year in your produce department. Simply add sugar, water and cranberries to a small saucepan and simmer for 5 minutes until the cranberries have burst and the sauce is very thick. Don’t cheat and add cranberry juice instead of the fresh cranberries. The cranberry reduction makes this cocktail! 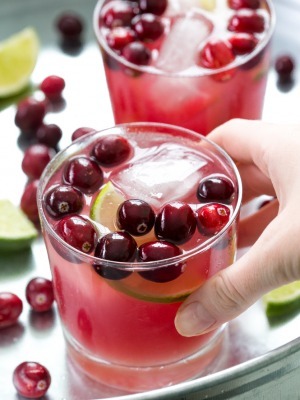 While the cranberry reduction is cooling, muddle the mint and the lime together in each glass. Top with rum and pomegranate juice. Add in cooled cranberry reduction, ice and top with the sparkling water. 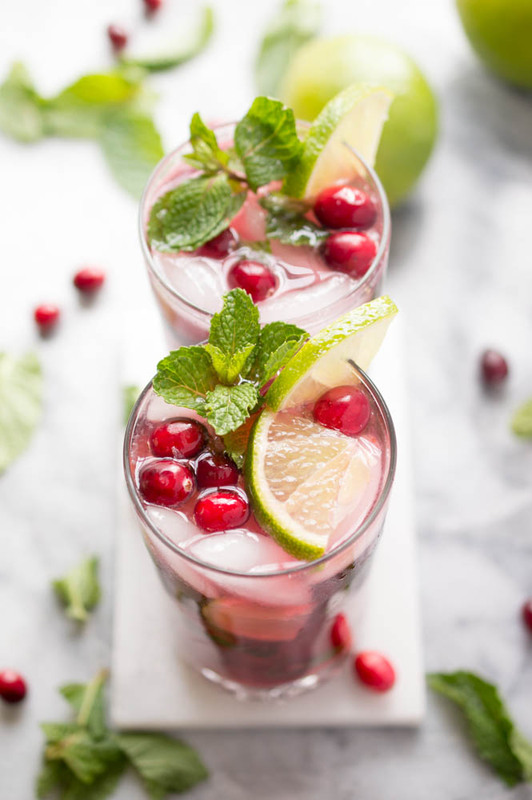 Take time out from the rush of the holiday season and sit back and relax with this Holiday Cranberry Pomegranate Mojito. Meanwhile, add mint and lime to each glass. Muddle together to extract the flavor of the mint. 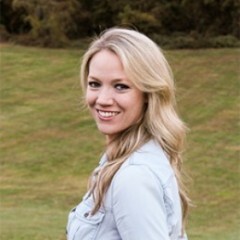 Looks gorgeous Kelley! I love mojitos and have tried all sorts of flavors! Not a cranberry pomegranate one though 🙂 Definitely on my to do list! Pinned! Thanks Mira! Hope you enjoy! Oh MY word woman! This looks amazing, I could use four right now. Please thank you. Thanks Erica!!! I could too! How delicious and festive is this mojito! 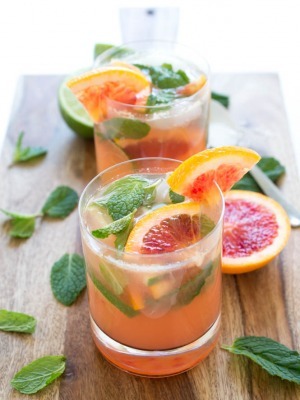 A perfect and refreshing cocktail to make here for the hot summer Christmas in Australia! This looks so refreshing! I’ve never had a mojito, but it looks so amazing, I’d definitely drink this! These have got to taste as good as they look! What a great looking drink! Love how bright these mojitos are! What a great drink for the holidays! Could these be any prettier!? I just love mojitos! Can’t wait to try this cranberry and pomegranate twist! Hi! How would I adjust this recipe to make for a beverage dispenser?? Hope you can help! I would love to make this for Christmas dinner! Thank you! I would multiply the recipe by either 4 or 5. The recipe serves 2. This should give you about 8-10 servings. I would make everything and then when you are ready to serve top with the seltzer water and pour into glasses filled with ice. I hope you enjoy & Happy Holidays! Do you use the “opened” cranberries in it or do you strain the reduction? I’m confused by this step 🙂 I make fresh cranberry sauce at the holidays and it’s very thick; I can’t picture using that in the drink! Thanks! No you do not strain this mixture. After it cools it goes directly into the drink. It is pretty thick but it is delicious! If you are worried about it being to thick you can always puree and strain. What about using raspberries in summer and strain into drink?? That sounds fantastic! I think it will work perfectly! This was delicious! Huge hit with my family over the holidays!